Don’t underestimate the power of this affordable, multipurpose household product that can bust grease, bring our sparkle, and even banish pests! Ammonia is pretty amazing! As a gas, this hydrogen and nitrogen chemical compound is pungent and dangerous. But the diluted household form, a nitrogen-based super cleaner, is a must-have in the war on common household dirt and grime. It’s so versatile, it can tackle a slew of chores—from achieving streak-free shine on glass to making even the greasiest stains disappear. It’s readily available anywhere, from the local grocery store to online e-commerce marketplaces like Amazon. A 64-ounce bottle is usually less than $5—and it’s strong stuff, too, so a little goes a long way. That inexpensive jug you buy today ought to far outlast trendier commercial cleaners. Before you shop, know that there are various types of household ammonia to choose from. You may see “cloudy” or “sudsy” versions—that’s ammonia with soap added, which is generally used for such domestic cleaning chores as treating stained clothing or scrubbing stovetops. But “clear” ammonia is suited to a wider variety of tasks (and you can always add a tablespoon or two of dish soap to make clear ammonia sudsy). You’ll also find ammonia that’s scented with lemon or pine to temper the stinging odor. The harsh smell serves as a warning, though: Working with ammonia absolutely requires caution. Pure chemical ammonia can cause severe burns and respiratory issues if it comes into contact with skin or is ingested. Even diluted in water, as is recommended for most cleaning purposes, ammonia can still be harmful. The most important safety rule to remember is: Never mix ammonia with chlorine bleach. The result is a highly toxic chlorine gas that can produce headaches, seizures, and other symptoms. It’s crucial to keep this in mind if using ammonia with laundry or to clean surfaces, making sure not to mix it with a detergent or household cleaner that contains bleach. Always be sure to wear chemical resistant gloves and ventilate the area well when using ammonia. And be sure to store it where pets and children can’t gain access. Practice these precautions as you put ammonia to work at the 10 tasks here—and enjoy a spotless home for pennies! Discoloration on your concrete driveway, garage floor, or patio can be an eyesore. Mix 1 cup ammonia with 1 gallon of water in a bucket and apply it to the stains using a big sponge or mop. Let sit for about 20 minutes, and then scrub the stain with a bristled brush. Rinse or hose the area with clean water. If the stain isn’t completely gone after the area dries, repeat the process till you’re satisfied with the results. To achieve streak-free mirrors, windows, and crystal, mix 1 tablespoon clear ammonia with 2 cups water in a spray bottle. 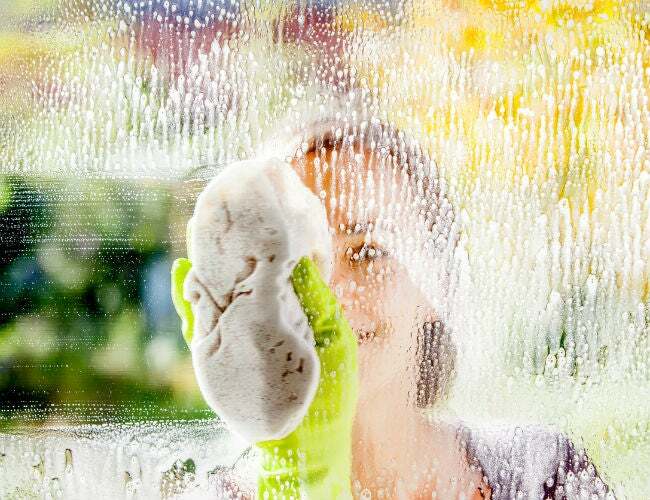 Spritz the solution onto glass items and wipe dry immediately with a soft, lint-free cloth for windows and crystal; paper towels work fine for mirrors. Stubborn stains on cotton, polyester, or nylon fabrics are no match for a solution of ⅔ cup clear ammonia, ⅔ cup dish soap, 6 tablespoons of baking soda, and 2 cups warm water. Mix in a bowl or bucket and apply generously with a sponge or spray bottle. 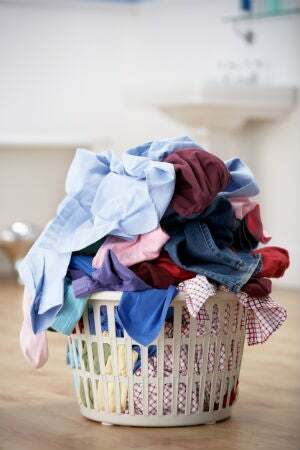 Let sit for about 30 minutes and launder as usual. If this proves too diluted for tougher stains like blood or grass, pretreat again with a solution of one part ammonia and one part warm water. Note: Don’t use this method on wool or silk; ammonia could eat through these delicate fabrics. And remember never to mix ammonia with any laundry products containing bleach. Tackle notoriously tough grease on stove burners with this trick. Place each burner in a separate sealable plastic bag filled with ¼ cup ammonia. Seal each bag to keep fumes at bay, and place in a sink or washtub for eight to 12 hours. Open the bags in a ventilated area, and remove all grease and dirt easily with a quick scrub of dish soap and water. Once the gunk is gone, thoroughly rinse the burners with water to get rid of ammonia residue. Let dry completely before using. Mix one part clear ammonia and one part hot water in a sprayer or other bottle. Apply generously to the stain by spritzing or with a sponge. After about 10 minutes of dwell time, place a clean old towel over the stain and press with an iron, blasting with steam, for about 20 seconds. Check your progress: The stain should start transferring to the towel. Repeat, with steam ironing and more ammonia solution if needed, until the stain is gone. Heat the oven to 150 degrees while boiling a large pot of water on the stove. Turn off the oven and open windows to ventilate your kitchen. Place a sturdy container, such as a glass measuring cup or metal bowl, filled with ½ cup ammonia on the oven’s top shelf and the pot of boiled water on the bottom shelf. Close the oven and let sit for eight to 12 hours, then remove the ammonia and water. Keep the oven door open, letting it air out for at least an hour before tackling the cleaning job. Because the grime has basked in ammonia fumes, it should be loosened and easy to remove with a sponge, warm water, and dish soap. This method is only recommended for electric ovens, as mixing ammonia with gas can be dangerous. If you want to use this method on your gas oven, make sure that the pilot light and gas lines are turned off. Kitchen or bathroom tiles looking tired? To clean and disinfect them, mix ¼ cup ammonia with 1 gallon of water in a bucket and liberally apply the solution with a sponge or a mop. If an area is especially dirty, use a soft-bristled brush to further scrape away the filth. Finish up by going over the entire surface with clean water and your sponge or mop. If gold, silver, diamond, or platinum jewelry has lost its shine, mix six parts warm water to one part ammonia in a bowl or small bucket that you don’t eat or cook with and add your precious pieces. After 15 minutes, remove the jewelry with your gloved hand, and then gently scrape away any stubborn grime with a soft-bristled toothbrush (one that’s no longer in use or designated for cleaning). Allow it to soak for another 15 minutes, remove from the solution, and immediately rinse with warm water. (Dispose of used ammonia solution down the drain while running the hot water.) Then polish the jewelry with a soft, lint-free cloth and let it dry. Don’t use this method on pearls, as ammonia could erode the delicate finish, or other gems since many stones now receive oil treatments that ammonia could remove. Ammonia is tough on every odor from fresh paint to burnt lasagna. Place a small container filled with about half a cup of clear ammonia near an offending smell, being sure to keep the area ventilated, to absorb the nastiness within hours. Ammonia’s strong scent can deter unwanted critters. Fill a saucer with clear, unscented ammonia, or saturate a rag or cotton balls with it. Then place in areas that attract pests, such as near garbage cans where raccoons prowl or beside cracks in the basement where mice enter. The smell will remind the varmints of predators, so they’re likely to catch a whiff and turn away, unharmed. That said, make sure to keep the ammonia deterrent out of reach of kids and pets.